No two people are identical, so it only makes sense that every mattress won’t provide the same sleeping experience to every person. A mattress is not just a mattress. It is an essential tool that directly affects your health, mood, and spinal alignment, so this is not a purchase that should be made without a considerable amount of understanding of your needs. One of the key things to understand if you are heavier is that your perception of “softness” is going to be significantly different than a very light person. So, basing your decision on reviews of “average-sized” people will likely leave you full of regret. You will see mentioned a lot that the “average” sleeper needs about a 3-inch comfort layer. While this is true, it is also important to understand that this number is actually only encouraged for side sleepers. Lighter individuals need a thinner comfort layer, if they always sleep on their back or stomach, so this is also something to keep in mind. Sleeping position needs to be considered alongside your body weight for maximum comfort and support. So, if you are a heavier side sleeper, you want to ignore that 3-inch recommendation and look for a mattress with a comfort layer that is a bit thicker. Four inches is usually ideal. This should provide a deep enough cradle that will effectively spread your weight, thereby relieving pressure. Thickness is not the only characteristic to consider. You also want to make sure that the comfort layer is a relatively firm top layer. As mentioned, softness perception varies according to weight. A layer that will feel a little too firm to a lighter person will feel softer to someone who is heavier. So, a firmer material that would not cradle a light person will cradle the recessed areas of the body in someone with above average weight. Make sure you choose a compatible support layer, as well. Sticking with one that is firm will provide the support that is needed to keep your spine properly aligned. Take everything you just read above and throw it out the door. If you are below average body weight, you could be quite disappointed by a bed that is praised by those of average weight, as well. You will not require much weight distribution and you will need a significantly softer comfort layer, if you want gaps between the body and the mattress supported. For example, if you lie on a firm surface the gap in your lumbar area is likely quite prevalent. The weight from points making contact with the mattress is not enough to force a firmer material upward to fill in this gap. So, you need a thinner and softer upper layer to make sure this happens. You can also get away with a softer and thinner support layer. If you fall somewhere in the average statistics then finding a mattress will be a bit easier for you. However, this does not mean you will be comfortable or happy with just any mattress that has positive reviews. You also need to consider sleeping position, material, construction method, etc. For the best possible outcome you will also put a lot of thought into your buying decision. By now, you might be saying, “Seriously? I have to consider body shape, too?” Well, if you want a mattress that will provide the highest quality of sleep to promote good health and a sounder rest then you do. 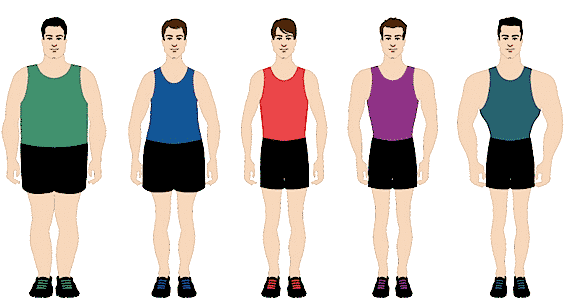 Body shape directly affects weight distribution. If you have a curvy body then you likely have more pronounced gaps that need to be filled in. When you lie down, your hips and shoulders are going to sink a little deeper into the mattress than a less curvy person. So, you will need a thicker comfort layer that will fill in these gaps, thereby preventing your spine from becoming misaligned. Ideal weight distribution for you will be achieved with firmer comfort and support layers. A straight/flat body is not going to need a mattress that excels in weight distribution. When you lie down, your pressure points are not as heavy, so a soft, thin comfort layer will be better suited for you. Your pressure points are heavier than someone with a straight body, but they do not need as much weight distribution capabilities as a curvy shaped body. You will likely find that a support core of average firmness paired with an average comfort layer will work just fine for you. However, if you have an average body shape, but lean towards being above or below average weight, you will have to find a happy medium to accommodate your needs. In a nutshell a person who is lighter than average needs a thin and soft comfort layer. Someone who is heavier would find most comfort and support on a mattress with a thick and firm comfort layer. A thin and firm comfort layer works best with a flatter profile, while a curvier body will need thick and soft qualities in the comfort layer they choose.